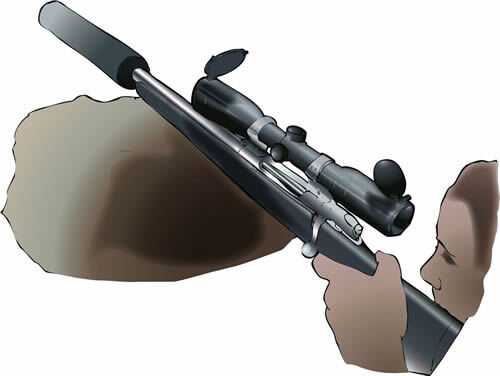 Practise adopting and firing from different positions before shooting at a live deer. 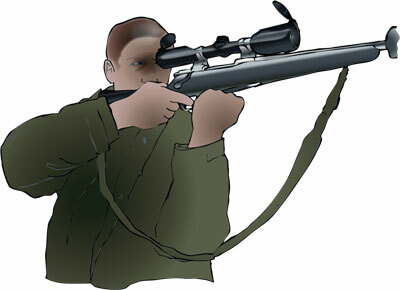 Grasp the small of the stock with the right hand and pull the rifle back into the shoulder. If used, the supporting hand should not touch or not be curled over the barrel or moderator (only the fore-end). Ensure that the barrel or moderator are not in contact with anything. Wherever possible make use of shooting aids to improve your stability/accuracy, for example, rest against a tree/ stick/ bipod/bank/ rolled up rifle case etc. Shooting free-standing or off the elbows with no rest should be avoided wherever possible. 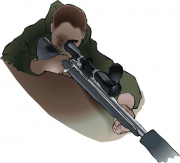 If shooting with a bipod, avoid putting too much pressure on the bipod. The bipod should just support the rifle and should not be under any other strain. If you intend to shoot from a high seat, practice firing from the type of platform that you would use and understand the effect of taking an elevated shot*. The following recommendations for firing positions are for a right-handed person — vice-versa for left-handed. Angle the body to the left axis of the rifle (if right-handed) and keep as much of it in contact with the ground as possible. It may be more comfortable to bring the right leg up if lying, rather than straight on to target. 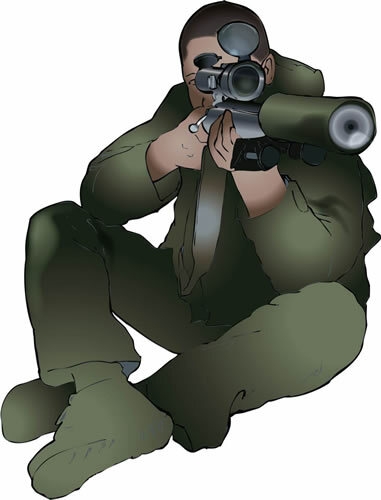 Use a bipod if available, or put a soft rest under the front hand or under the rifle fore-end. Shoot off elbows only where there is no alternative. 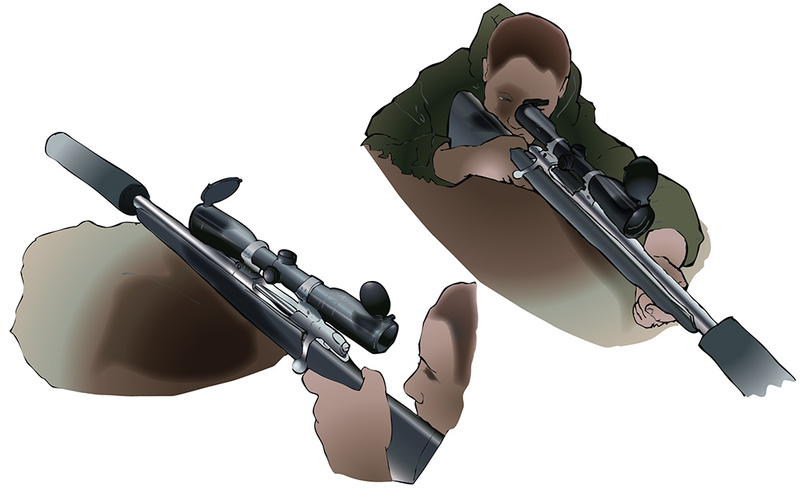 When using a secure rest, if right handed, pull the rifle firmly into the shoulder with the right hand, and bend the left arm bent across the chest so that the hand supports the right elbow or the toe of the stock, thus forming a stable ‘triangle’ of support. Either cross your legs or dig your heels into the ground with legs apart; face slightly to the right (if right-handed). Rest both elbows on the inside of your knees and use a stick (or extended bipod) to steady the rifle fore-end if possible. If right handed, kneel down sitting on the heel of your right foot, with your right knee on the ground. 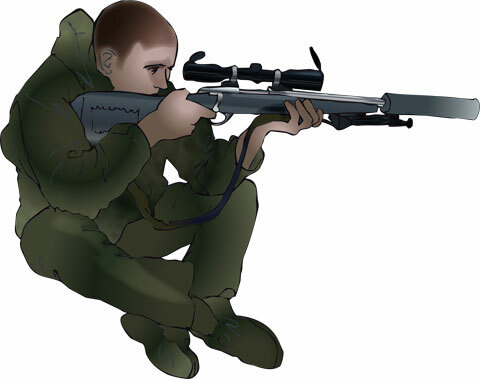 Rest left elbow on the left knee, whilst keeping your other elbow under the rifle or locked against the body. 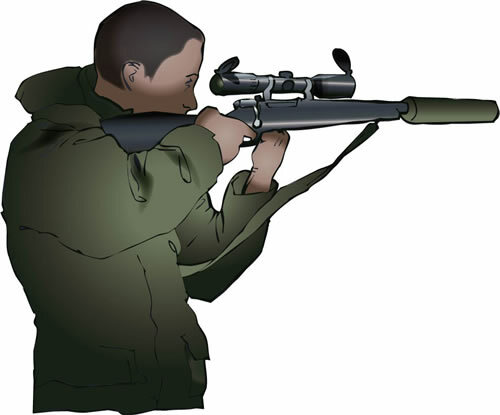 Use a stick (or extended bipod) to steady your front hand/rifle where possible. Face slightly to the right (if right-handed) and keep body upright. Keep your left arm under the rifle. If you have no stick, try to lock your arm against your chest and rest the rifle on your hand. When using a stick(s), it/they should be perpendicular to increase stability. Try not to remain in the aim position for too long. Use a soft rest under your left hand or the fore-end if leaning on something like a wall. If a tree or post is being used, never rest the rifle barrel against it. 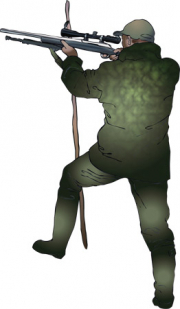 It is often steadier to lean your body against the tree and use a stick (or better 2 sticks) to support the rifle fore-end. A soft pad can easily be made from material such a water-pipe insulation and taped over the shooting rail. A soft pad/bean bag can be used on the vehicle roof or fitted to the vehicle frame.